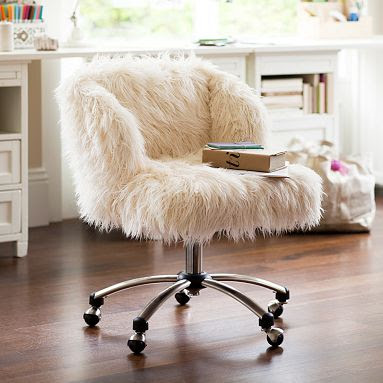 Home Sweet Home: Would You Love To Sit On This Chair? I was looking for a nice chair that could complement the study table of my son in his bedroom but instead of finding a chair for him, I found a chair for me (lol). I love this chair with a brushed steel base. Looks so stylish with 100% acrylic fur. Very elegant! Oh well....the problem is the price tag! It costs $259. Can't afford it this time. But in case any of you would love to have it, it is available at pbteen. Disclaimer: This is not a sponsored post. All opinions are mine. That looks great and comfy to lounge with during winter. I like the acrylic fur part.